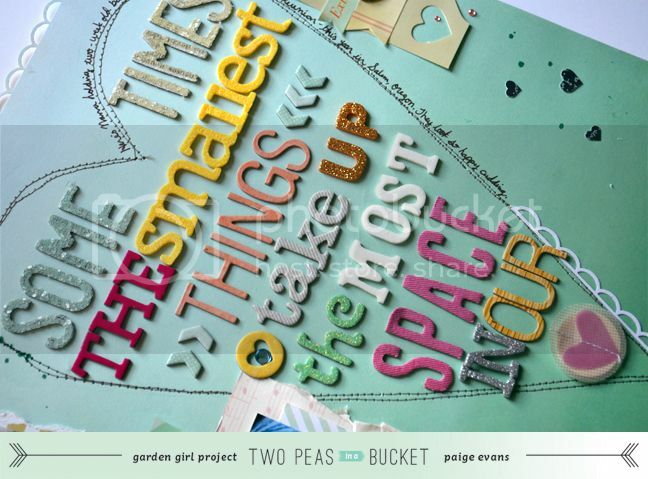 My second Scrap Your Stash layout and accompanying video is up at twopeasinabucket.com today! Description: If you're like me, then you have more Thickers than you'll ever be able to use in a lifetime. The problem is American Crafts keeps coming up with more fonts, sizes, textures, colors, and combinations that I HAVE to HAVE! One of my favorite ways to use up my brand new and older Thickers is to create a super long title showcasing a variety of my favorite Thickers. 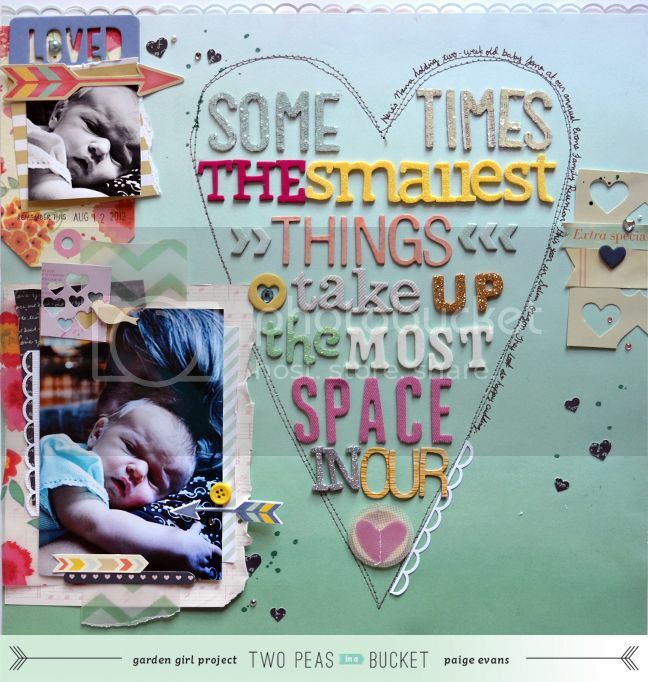 These sweet photos of my daughter Jane and my mother-in-law were perfect for the long title “Some times the smallest things take up the most space in our hearts.” I chose fonts, colors, and sizes that matched the brand new Lucky Charm line by Dear Lizzy. Some fonts are new, some are straight from my stash. They all work well together based on the colors pulled from the photos and line. The important thing to remember is I can make the Thickers work the way I want them to to make them fit the space. Overlap them to squeeze them in a tight area or space them out to fit a larger area. Journaling says: Here's Nana holding two-week old baby Jane at our annual Evans Family Reunion this year in Salem, Oregon. They look so happy cuddling. How to: The video shows how to create the layout from start to finish. Here it is written: Sketch out your design, count up how many words are in the title, then choose the same amount of Thickers fonts as words. Die cut a large heart and trace it onto a patterned paper background; erase most of the pencil lines then stitch over the traced heart to define the edges. Fill in the heart with the Thickers. Don't press too hard on the Thickers until you're sure of the placement. Squeeze letters together by overlapping them or space them out to make them fit in the heart accordingly. Create photo mats from layers of patterned paper and vellum, decorate them with embellishment clusters, and stick them down. Drop spray mists and smatterings of jewels and pearls to finish. Challenge: Use Thickers to create a long title. Every month a winner from all the SCRAP YOUR STASH entries will be drawn and rewarded with a $10 gift certificate. Winner will be announced on the 2Peas blog! This video took about half as long to make (practice makes perfect! ), but now I think I need to get a lamp to make the lighting the same throughout the entire video! I'm up for suggestions for Scrap Your Stash #3! What do you want to see in your stash scrapped? Email me at paigetaylorevans at gmail dot com and let me know your address!! When I am catching up on blog reading, I don't even bother to put socks on anymore. What is the point, cause I know you will just knock them off! Again, incredible page. Nice, Paige! That's lots of hard work and creativity. Love it! I totally want to do a page for each of my daughters with the "sugar and spice and everything nice...etc" title. love all the different thickers!! You must have gotten a peek into my scrap room when you mention that huge supply of Thickers! Yes, I truly love them. LOVE your big title, great idea. Oh wow this is GORGEOUS! Love the lettering and the heart shape. Amazing! This is sooooo cute, Paige! 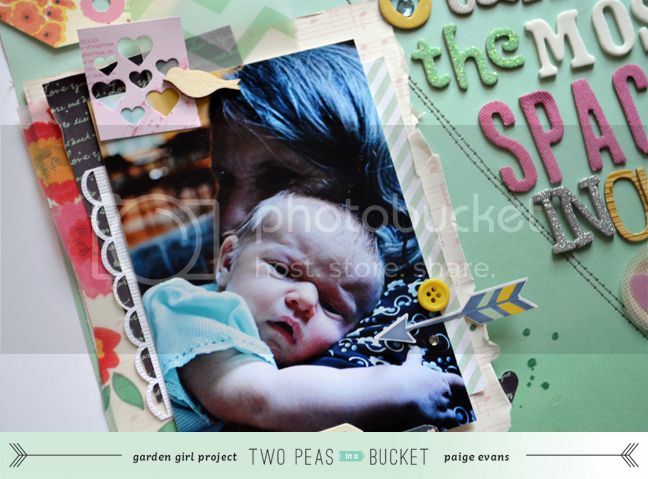 I love the heart (duh) and the newborn picture just makes my heart melt! FUN FUN and super cool page!!! LOVE how you worked the thickers!!! This is absolutely beautiful! Great video, too! BEAUTIFUL layout! LOVE all the letter stickers! And thanks so much - just sent you an email with my address!!! Love this so much. can't wait to put my thickers to good use! hmm, I'd love to see a scrap your stash video on how to use up those sticker sheets/books. I've got a ton of dear lizzy & Amy tan stickers that I love to pieces, but can't seem to make a dent in.